My apartment desperately needs some attention, but that's what December is for, right? I did manage to clear all the junk away from my radiators today, so when my landlord finally turns on the central heating (if it's not on already. I haven't switched it on yet so I don't know) I can use it. So that's something. Other than that, my day was all about writing and wasting time on Twitter. First line: She couldn’t be sure, not without testing it, that she’d picked up the storng emothion from teh girl at the grocery store because she’d touched her. Apparently conjuring enthusiasm for NaNo in a new region is harder than I thought. I finally hit a good spot in my primary project this afternoon, so here's hoping. And this is picking up where we left off, since I have no idea where I started today. First line: Since the start of her empathy project the three of them had had mood swings and energy fluxatations like none of them had ever seen, not even during puberty. Last line: A bad mood while grading did not bode well for her students, so she tried to save it for her up days. First line: Meghan made it through the front door before collapsing on the couch. Last line: On the other hand, she enjoyed a good fantasy novel as much as anyone, and the weird in her house was beginning to get to be too munch to ignore. Yesterday I got my stuff moved in and mostly unpacked (my books are back! Yaaaaaay!!! 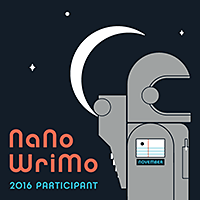 ), and then dashed off a couple sentences on my secondary project at the end of the day just so I had something to update on the NaNoWriMo site. Hence, no blog post, because there wasn't anything to bother posting. Today's a little better--between some furniture arranging and cooking, I got a few words in. First line: Since they didn’t even hear her come in, she headed straight to her room to see if her luck would hold out on being super-productive while in a good mood. Last line: A course of antibiotics to make everything better was more what she was after. First line: Claire was never sunshiny. The best they could hope for most days was partly cloudy. Last line: Were they even saying individual words, Claire wondered, or was it just one stream of noise coming directly from their brains and out into the universe? First sentence: "Go sit down before you pass out." Last sentence: This project was already taking a turn for the weird. I didn't. I went to Austin over the weekend and have been all over the place since I got back: finding my new polling place, taking my first bike adventure to the grocery store (in the rain, natch), getting internet in the apartment and movers scheduled so all my stuff can finally join me, doing laundry, etc. NaNo has taken a bit of a back seat, but with any luck, I'll have a real update to share tomorrow. First line: "I don't know if I can handle telling Josie this." Last line: "What are you having?" "A bowl of sugar filled cereal." "Yeah. I'll have that." I'm technically working on two projects this NaNo, but one of them is my fallback for when I'm stuck on the main project and need to give my brain a break to get back on track. After a couple of NaNos when my main project fell over and refused to go any further halfway through the month, I'm being proactive. That said, all of my first/last lines will be from my main project, currently titled Stay With Me, unless I'm so stuck I couldn't even get out two sentences that day. First line: Josie's obsessions tended to come and go, and there was no keeping up with them. "What have we just let ourselves in for?" Claire asked. "A life-enriching experience," Meghan said. "Or maybe just Josie talking less." "I feel enriched already," Claire said with a grin. So, I may not get to vote next week. I have a couple other options that I'm hoping magically come through. Anyway! 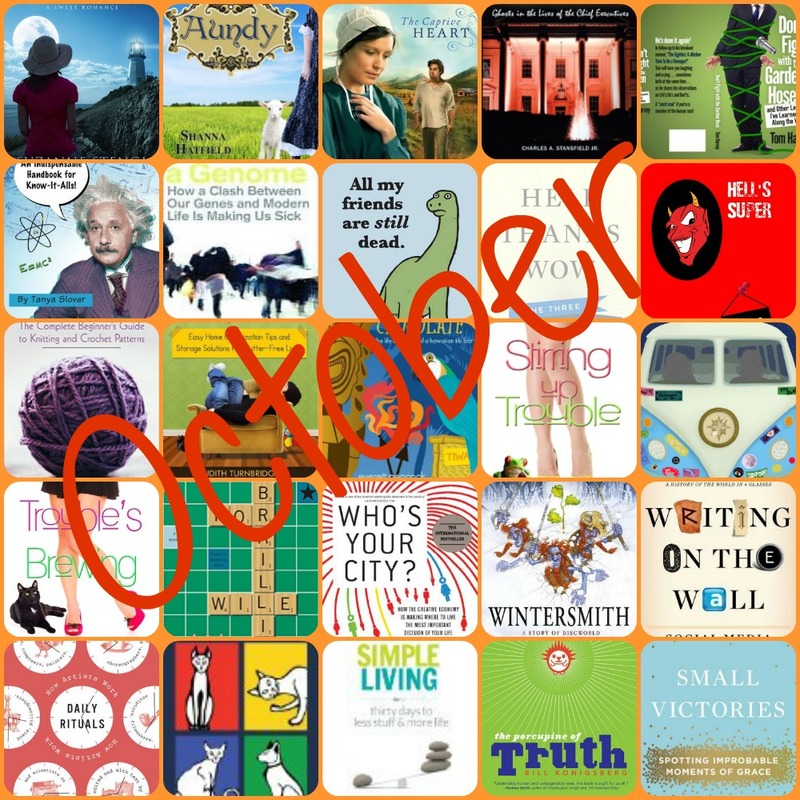 It's November 1st and NaNo is here! Yay! (Do I get up and dance around the room every time I watch that video? I totally do.) My three main characters finally have names! First names, that is, let's not rush things. We have 30 whole days, you know. Well. 29. Today's first line: "Ben Franklin was an idiot." Last line: "Tell you what, Jo, you let me know when you find out, okay?" Here's what happened with my reading challenges in October. I went a bit crazy with reading this month, because: I moved into my own space, so no more guilt about neglecting the relatives while I read; I'm spending a lot of time on public transportation again, which is prime reading time; and I won't be doing much reading in November, because of NaNoWriMo, so I decided to get as close to complete on all these challenges as I could. A lot of what I've been reading are Kindle freebies I've collected over the years, and many of those are sadly forgettable. I try to be as kind as possible in my reviews while still being honest, but some books are clearly being published when they're not yet ready for outside readers, and that's a shame. After joining my new local library and seeing the wealth of reading material available in Cincinnati (41 library locations. 41!! Where has this city been all my life? ), I went back and forth on bumping I Love Libraries challenge to the next (and highest) level, which initially seemed like a bad idea since NaNoWriMo is upon us. I finally went with bumping it up, on the grounds that December is long enough for a few books. I'm calling Read it Again, Sam complete, since my entire personal library is still sitting in storage (prayers, crossed fingers, and other things that this will be remedied shortly) and is unavailable for re-reading, so moving to the next level is probably a bad idea. I moved Mount TBR up to the next level, and I'm almost done with it, so unless something crazy happens this is the level I'll finish the year on. And finally, after November is over, I'll make a decision on raising my Goodreads challenge. My usual practice has been to raise it by one book every time I read a book for the first 20 or so days of December, if I'm getting close to completion. My plan for October was to get within 10 books left for December, and I overshot that a bit. Links are to and images are from Goodreads, where all my reviews are written. Haunted Presidents: Ghosts in the Lives of the Chief Executives, Charles A. Stansfield Jr.